Prevents a short circuit at the receiver, if a servo stalls or is faulty. 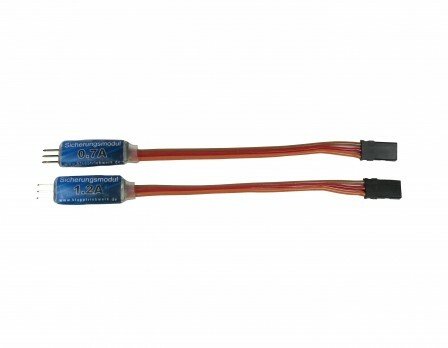 The module is simply connected between the receiver and servo. The connected servo must not exceed a current draw of 2.6 A / 1.2 A (on time), at a short-term exposure of 3A/2A (within 5sec.) the fuse will not trip. After tripping of the fuse, the current is reduced to about 300mA and is not turned off! If short or default is still present, the fuse triggers again. If the cause is, for example, a clogged landing gear, it will work again, as long as the power is not faulty.